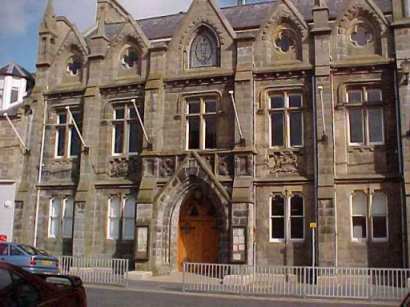 Highland Councillors will be asked at a meeting on Wednesday 4 December 2002 to back plans for a £2.7 million redevelopment of the historic Thurso Town Hall and the adjacent Carnegie Library, now used as a local museum. Members of the Resources Committee, meeting in Inverness, will also be asked to determine how the Council's contribution to this project - property and architectural fees totalling an estimated £360,000 - should be funded. As owners, the Council is piecing together a funding package aimed at safeguarding the popular town centre buildings, which are in urgent need of restoration and upgrading. The plan is to merge the two buildings to produce a 21st Century multi-purpose community and integrated visitor centre. Local people will be able to contribute ideas on future use of the building when two Open Days are held in the Town Hall early in the New Year. Initial partners are Thurso Heritage Society, Highlands of Scotland Tourist Board; Scottish Natural Heritage, and the UK Atomic Energy Authority and the Queen Elizabeth Castle of Mey Trust. Funding is hoped to be attracted from Europe as well as the Heritage Lottery Fund and Historic Scotland. a major permanent exhibition designed to explain how the heritage of the North Highlands relates to the area today, encouraging visitors and local people to explore the North Highlands and to visit the area's many sites and attractions. This exhibition would be populated by Scottish Natural Heritage, UK Atomic Energy Authority, the Council, Thurso Heritage Society, Castle of Mey Trust and the International Environmental Research Institute. Interim findings of an economic impact study carried out for the Council shows that the redeveloped Town Hall can attract between a cautious 25,000 people to a more optimistic 43,000 visitors each year generating an additional income for the Caithness area of between £317,000 - £1,140.000. It concludes: "We believe the concept of a combined partnership approach to developing the Town Hall could be a most effective way of safeguarding the physical structure of the building and that the proposed content could provide a good focal point for both visitors and the residents of Thurso." Councillor John Rosie, Chairman of the Council's Caithness Area Committee, said the Town Hall and Carnegie Library were distinguished historic buildings with impressive frontages which had the potential to be a terrific community asset, open and active throughout the week. However, both buildings were badly in need of restoration and significant repairs in order to prevent further deterioration. Without major improvements, they would also fail to meet the requirements of the Disability Discrimination Act. It was proposed to restore the buildings to their original condition, both internally and externally, with the removal of all false ceilings, and to install a lift to serve the upper floors of both buildings and provide disabled access and toilets. The only proposed major alteration would be the provision of a mezzanine floor in the upper hall to provide additional exhibition space. He said: "The Council could not afford to take on this redevelopment on its own so the benefits of this partnership package are hugely significant. It is too good a chance to miss. This is a terrific opportunity to give the buildings a much-needed and long overdue refurbishment and create a multi-purpose 21st Century community facility in Thurso. "It is particularly important that the needs of the local community are taken into account in planning the redevelopment work. We are therefore pleased to be able to open up the Town Hall for two days early in the New Year so that local people can see around the facility as it currently stands; view plans to date; and contribute any ideas they may have about the future use of the building. Users will also be invited to form a group to feed into the redevelopment plans. In our talks with users we have been emphasising the opportunities for them to have enhanced access to improved facilities. There will also be benefits for the whole community by attracting many more visitors to the town centre." Mr David Noble, chief executive of HOST, said: "This project gives an excellent opportunity to provide a one stop shop for visitors and local people in an attractive historic building. Bringing facilities under one roof is a sensible way of using scarce resources, and our own experience in other parts of the Highlands is that this approach is popular with visitors." SNH Area Manager in North Highland, Lesley Cranna, added: "The natural heritage of Caithness is a rich and wonderful resource which this centre would help to promote. We would like to see the centre identify places where both local people and visitors are encouraged to enjoy the area's wildlife and scenery."